Here you will learn how to cut polygons with various algorithms. Remember to use the data structures from the first page, such as Plane, and everything should be in x-z-space (Create a new Vertex object with a Vector3 as its position and where y = 0). You can use the Sutherland–Hodgman algorithm if you have a polygon and you want to cut away the parts of that polygon that doesn't intersect with another convex polygon. As seen in the Wikipedia article, the polygon you want to cut doesn't have to be convex. This algorithm is best explained in this YouTube video: Sutherland-Hodgman Polygon Clipping Algorithm. 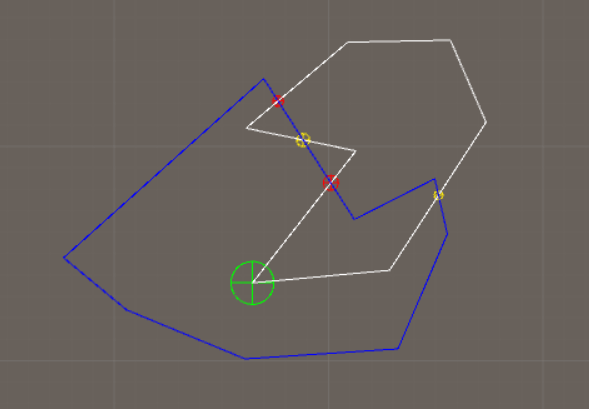 The algorithm assumes that you have sorted the vertices counter-clockwise, so you can travel along the list you send to the algorithm and you will end up at the beginning of the polygon. So you can't just send it random vertices. It is also assumed that you know how to find out if a point is to the left or to the right of a plane (which is the same as finding the distance to the plane), how to find the intersection point between a ray and a plane, and that you know how to clamp a list. If not, you can find the algortihms here: Useful Algorithms. 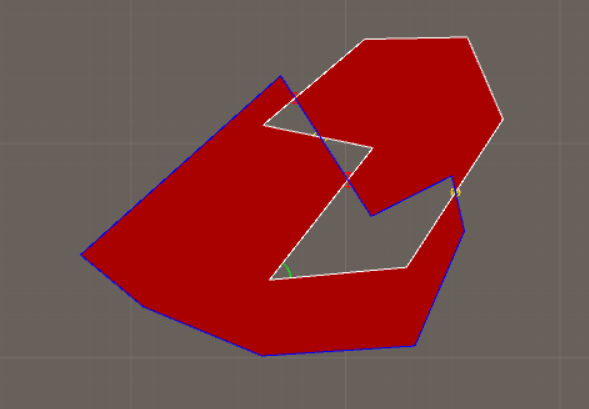 The reason that there's two methods is that it is sometimes more efficient to create the list with clipping planes once if we for example want to cut several polygons with one polygon. This will be useful when we create a Voronoi diagram. The image below shows the result when you clip two triangles. The blue and gray spheres are the positions you store as Vector3 in a list and that you send to the algorithm. The Sutherland-Hodgman algorithm was kinda limited - it could only find the intersection of two polygons and one of the polygons had to be convex. If you have concave polygons (or convex or one of each) and you want do do other types of so-called boolean operations on the polygons, then you need another algortihm. One such algortihm is the Greiner-Hormann algortihm, and it was presented in the report Efficient clipping of arbitrary polygons which you should read. 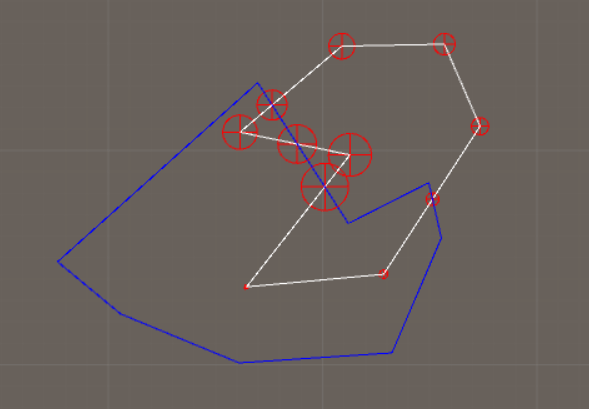 Next step is to figure out if the intersection-vertices are entry points or exit points. In the image below, if we look at the white polygon which is the main polygon (the blue polygon is the clipping-polygon) and look at the first vertex in that white polygon (the big green circle), we can see that it's inside of the blue polygon. If we travel along this polygon (counter-clockwise) we will encounter an intersection-vertex and we need to know if this is an entry or an exit-vertex. Because we started inside of the polygon, we know this has to be an exit-vertex (yellow), and we are now outside of the polygon. Because we are now outside we know the next intersection-vertex we encounter has to be an entry-vertex (red). 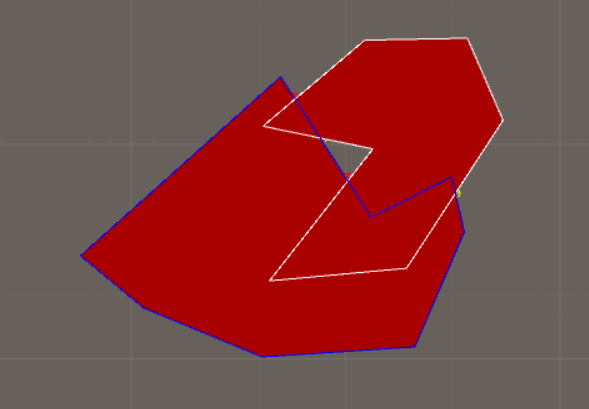 Also the entry-exit-vertices belonging to the clipping-polygon have to be determined. To get the intersection of the two polygons, we should start at the first entry-vertex of the white polygon and move forward until we encounter an exit-vertex. 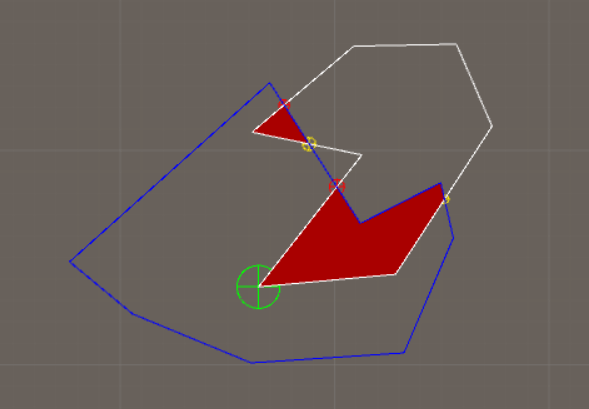 When that happens we should change polygon and instead travel along the clipping-polygon until we find another entry/exit-vertex or are back where we started. This process is repeated until we have visited all entry-vertices. 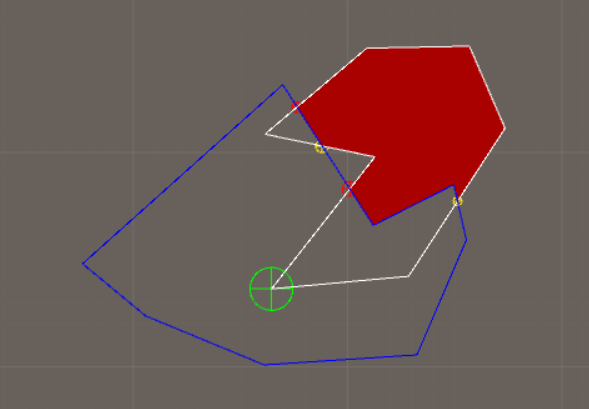 If we do another boolean operation on the polygons, such as the difference, we just travel in the opposite direction. To get the union of the polygons, we need to do this three times: find the intersection of the polygon and the clipping-polygon, find the difference of the polygon and the clipping-polygon, and find the difference of the clipping-polygon and the polygon. Then we just combine them into one large list of polygons. To make this work you need to know if a point is in a polygon, how to clamp a list index, and how to tell if two line segments are intersecting and get the intersection point if they are intersecting. If not, you can find the algortihms here: Useful Algorithms. //From the report "Efficient clipping of arbitrary polygons"
//Is the polygon inside the clip polygon? //Have we found a new polygon? //Is a polygon One inside polygon Two? //Is this an available entry vertex? 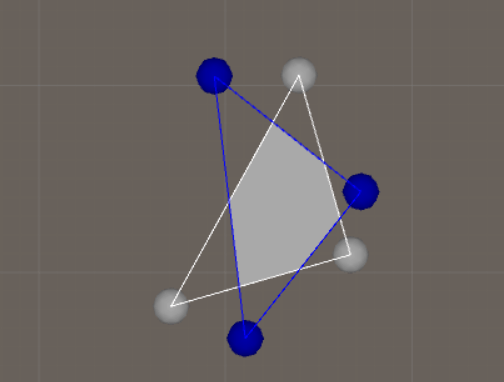 The problem with this algorithm is that it will fail if one vertex belonging to one polygon is exactly on an edge belonging to the other polygon. To solve this you can modify the algorithm as described in the report "Clipping of Arbitrary Polygons with Degeneracies". But some say that paper doesnt cover all cases, so another similar solution to the Greiner-Hormann algorithm is an algorthm described in the paper "A new algortihm for computing Boolean operations on polygons" which I may implement in the future.